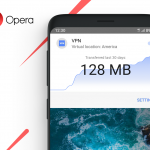 A couple of weeks ago, we introduced new features to our Opera browser for Android, such as a brand new, built-in cookie dialog blocker and a long-tap action feature that allows you to open new tabs or search in private mode directly from your smartphone’s home screen. Below, we will show you how to use these new features. We’ll also share with you some of our all-time favorites to make your daily browsing experience even better. We hope you enjoy these life hacks as much as we do at Opera. If you are not using Opera browser already, click here to download it. We recently added a life-saving feature to the Opera for Android browser which is the built-in cookie dialog blocker. Once you enable it, the feature will remove all cookie alert dialogs that may appear when browsing a website. The cookie dialog blocker will give you a cleaner and neater web browsing experience so you can focus on the content that you are interested in. Click here to watch our YouTube video and learn more about it. Opera has the fastest access to new tabs and private mode so you can browse incognito right away when you need to. In addition, we added new home screen shortcuts to get you right where you want to be in the product . All these features will be shown to you by only performing a long tap on the Opera icon in your device’s home screen. If you are engaged while reading a web page, but found something else that is interesting for you on the same page, perform a long tap on a word and explore a variety of search and translation functions in the submenu that pops up on your screen. This menu gives you several functions to perform with the highlighted word, depending on the apps installed on your device. Some of the functions displayed are: starting a new search, searching privately, translating a word or defining a word with a variety of dictionary apps which you can download to your device. Opera’s night mode has been designed so you can protect your eyes while browsing in dark or low-light conditions. When enabling night mode in Opera, the browser will automatically switch to dark theme and will draw a dark overlay over your screen, making reading easier on your eyes. Night mode can be turned on easily by tapping the O logo and enabling the bar in the menu. QR codes are everywhere: you can find them in museums, restaurants or in the labels of some products. Use your Opera browser to scan QR codes when you need to and avoid having to download additional QR code apps. The QR code reader is easy to find on Opera. Tap on the combined address and search bar and then on the QR code logo on the right side. Now you are ready to scan – easy and handy.